Today was another stunner all over the lower North Island and Darlene had lain down a new blog challenge to capture a photo that showed off either spring or autumn depending on the particular hemisphere one happened to be inhabiting. During the week we'd had a bit of a cold snap and Neil had mentioned that there was plenty of new snow on his mountain (you can see it out his window) and as there hadn't been much snow last time I was up there I thought it might be worth a ride to check it out. It wasn't that cold as I was getting ready to hit the road but I figured it could be further up where the snow was so I geared up for the worst and fired up the heated grips too. Heading out of Palmy the worst thing I had to contend with was the low sun which did a fantastic job of blinding me as I rode across to Cheltenham and onto Vinegar Hill. Vinegar Hill was a nice warm-up with just a few wet (but not frosty) corners and only one 4WD on my side of the road to deal with. Turning onto SH1 it got noticeably cooler and I was surprised at how little traffic there was on the road. 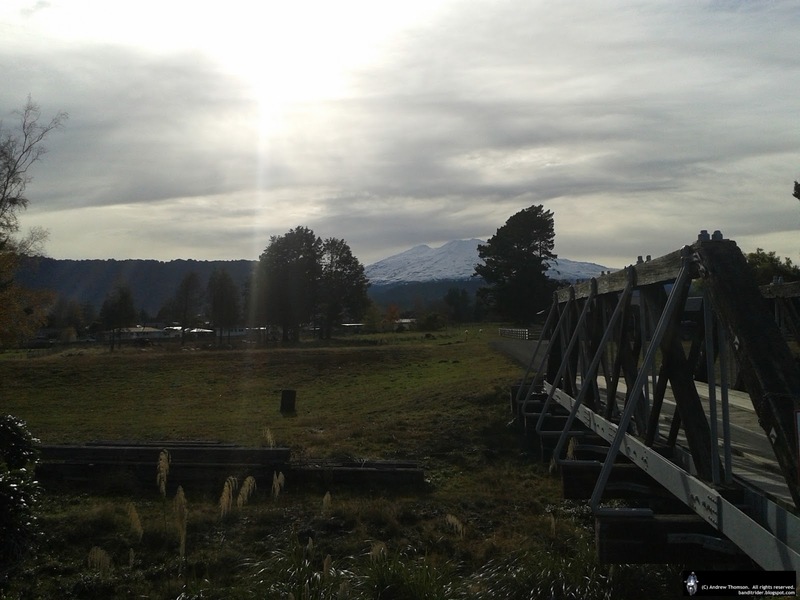 With a 4km/h tolerance this weekend I took things pretty quietly all the way up to Waiouru where I stopped for a couple of pictures and some petrol. We were pretty well behaved on the Paras and the further South we got the warmer it got too. It was turning into a pretty nice winter's day. Once we'd run out of Paraparas we stopped in Upokongora for a drink and a natter before taking our normal route through Okoia and Fordell across to Hunterville - more great riding. In Hunterville there was another pitstop before I parted company with the others to take Vinegar Hill (again) home and they cruised on up SH1 back to 'kune. Another cracker day out on the bike - fantastic! And finally, some video from Nick, including his little adventure off the road. Hopefully he's on the road to recovery and will back on the bike soon. Neil was that excited to get back onto the gravel that he didn't get around to making up a funny name for this month's BRR Adv ride...but never mind it was a doesey! Our first little squirt took us over to Beaconsfield via a couple of really neat and fast little gravel roads. It was a lot of fun and gave me a bit of confidence in my new front tyre that I had been wondering how well it would handle the gravel...it helped that the gravel was in perfect condition. After some more great gravel and a short stop (see above) we got onto one of our favourite roads - Peep-O-Day Road. Once again the gravel was in great nick and I had a blast trying to keep up with Ross. Unfortunately, when we nearly were back out onto the tar, Neil got a phone call telling him that someone had gone down and hurt themselves. We all doubled back and were soon at the scene where a F650 was lying down and Nick the rider in a bit of grief. Emergency services were soon on their way (although we were officially in the middle of nowhere) and we righted the bike and got Nick vertical. Surprisingly we were soon joined by several (3!) fire service vehicles and a cop with an ambulance still to come. Nick's corner. Bike already parked in a farmer's shed. After lunch it was time take in another favourite - Watershed Road. My new tyre handled this bit a bit better than the deep stuff before lunch but as you can see I did get left behind a bit. A couple of stretches of seal then took us to our last bit of gravel of the day - Pohonui Road. We've also done this one a few times and it's a great ride - not only is the ride fun but the views are really nice as you cruise down the valley. The Road eventually spits you out at Turakina Valley Road and this is where we stopped and said goodbye to Neil who got to ride home via Turakina Valley Road - lucky sod! The rest of the ride was all seal - from the quick squirt back into Hunterville (where the Welly riders turned South) and then home via Vinegar Hill with a KTM in tow. I rode to work today and it was fantastic! It's been a while as the Vee was unwarranted for a spell while I was organising a tyre for it. I usually only ride when the weather is nice because I'm a sook now and own a car. No sense getting all geared up for a short little ride to work. Besides, this guy said it'd be sweet...Man, has my opinion of him gone down hill! Initially my gear was holding out well but the rain had better ideas. The closer I got to home the harder it rained, there was more surface water and even the traffic was splashing me as it went past. It was great fun but chinks were starting to appear in the waterproofedness of my gear. The yellow pants were fantastic but sitting on the bike drew them up enough to expose the bottom of my trouser legs and of course my socks and shoes. I was starting to become aware of how wet the rain was. By the time I got home (about 15 minutes after leaving work) the rain had penetrated through my jacket (I was wearing an ancient Spidi jacket that hasn't been waterproof for some time) and jersey and my gloves were soaked through. The dog heard me arrive so he joined in on the fun standing out in the pouring rain while I opened the gate and parked the bike in front of the shed. Getting inside it was a toss up who was wettest and my jacket is hanging up dripping onto the old towel that I used to dry off the dog. The rest of the gear is either hanging up to dry or in the hot water cupboard. I still say, it was a fun ride! Getting the wheel off is the easy bit although as the stand doesn't quite get the bike up higher enough the front mudguard needs to be removed (or nearly removed with most of the bolts removed) and the brake calipers unbolted and slipped off the discs. Next up is breaking the bead and removing the tyre. Breaking the bead on the front tyre was approximately 1,000 (maybe 1,001) times easier than when I did the rear - I just pushed down on the sidewall (after soaping it up) with a piece of 4x2 and Bob was my uncle. Then it was time to get the tyre off. Using my new spoons and rim protectors this was pretty easy too. But in the end it was on and my compressor soon had the bead set. I then lowered the pressure back to somewhere around where I run it and re-installed the wheel onto the bike. Yes, Sunday was our monthly ride and this time around Neil was leading the ride and after a few recce rides (just 'cause we can) over the previous couple of weekends he settled on a route that would take us through to Ohakune for lunch before returning back to the Rangitikei. Once again, after taking the Okoia turn-off, we stopped at Upokongaro for a quick regroup and to pick up two riders joining us from Wanganui. From here we were forced to take in the always delicious Paraparas through to Raetihi. Naturally we were well behaved at all times. Now we just had a short ride across to Ohakune for lunch but Neil managed to keep us from getting bored by introducing us to a little loop that took in a couple of narrow little back roads - Pakihi and Lake Roads. Getting a peek at the snow on the mountain was an added bonus to this nice little diversion. In Ohakune we parked up amongst a few other bikes who's owners' were also out enjoying a lovely day and ordered our lunch. And then there's the views! Dropping back down the hill I passed the others going the way and then had some more fun playing in the mud. 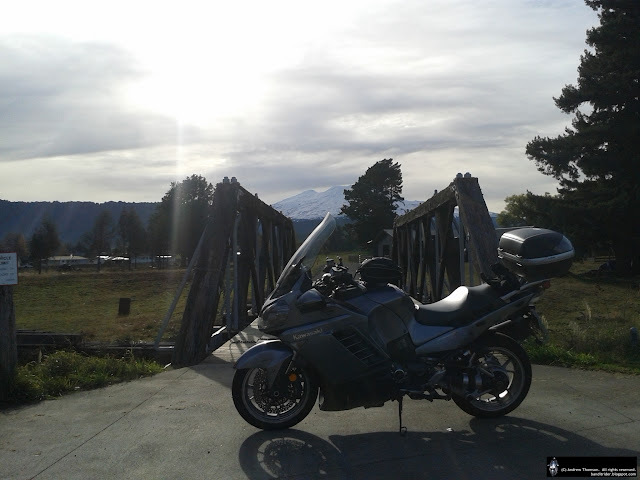 Back in Ohakune I gassed up the bike and waited by the big carrot for the others to come back down the mountain. Back onto SH1 we carried onto Utiku where we turned off again to take in more of the roads Neil and I recced a fortnight earlier. 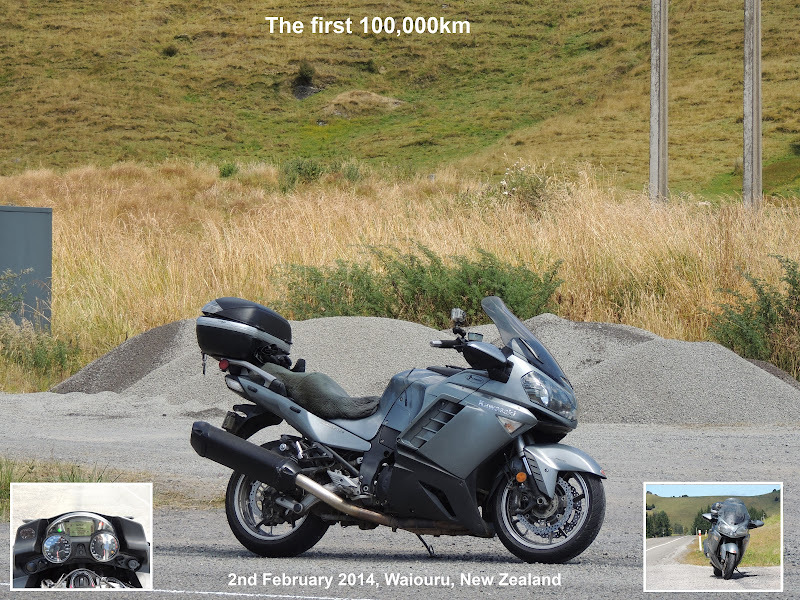 These roads were still good fun and also still took us through to Kimbolton via Rangiwahia. In Kimbolton it was time for a catch up and for some of us to head home rather than returning to Hunterville via Vinegar Hill. I ended up bailing on Vinegar Hill as I'd done it about 3 times in 3 weeks so I simply followed Meanie and Monie through to Colyton where they carried on home to Ashhurst and I turned off to make my way back into Palmy. Another great day's riding with the BRRBT crew and yet again with very nice weather - long may it continue!